I’m guessing you would agree that there a a TON of Keurig coffee makers out there! It’s really difficult to understand the differences and know which one is the Best Keurig Coffee Maker. Well, if you want the Best Keurig Coffee Maker, I promise this post has what you need! We’ve researched and have picked one Keurig we believe is the best for features, price and quality. If that Keurig is too simple, or is missing a feature you really wanted, then comparison shop using our Comprehensive Keurig Comparison Chart. There you can compare the different features for each Keurig Coffee Maker. If you aren’t sure about a feature, we provide additional feature descriptions to clarify exactly what each feature provides. We also cover commercial Keurig coffee makers as well as their Cappuccino and Espresso systems. There is even some coverage for their soft drink system. If you think you might have needs that exceed “normal” (I know I do! ), read on. Because below you will find the chart you need to easily compare the different brewing systems from Keurig. And, we provide reasons why you might choose one over another. Different people have different needs. Keurig recognizes this and has provided (some might say over provided) different models to suit each individual’s needs. 1 Why Keurig? Why Now? 4 Keurig Makes More than Coffee? 6.1.2.1 Is the K15 Different Than the K10? 6.2.1.1 How Does it Work? Well, that idea came about while walking down the aisle of my coffee bean grocery store. I stopped to look for any new coffee beans brands that I haven’t heard of, and, what I noticed while looking, was that Keurig or Keurig-like “K-cup” products covered almost 3/4ths of the aisle. It made me a believer that while coffee beans might make the best tasting coffee around (at least to most that have truly tried both), convenience can still rule the day as long as the quality is still respectable. And, with the amount of K-cup products that dominate the coffee aisle of the grocery store, it’s very clear that the quality is there. People are obviously coming back over and over again to K-cup products. If not, the grocery store aisle would look very different. When we went shopping for our own Keurig, we got lost VERY quickly. So, we felt like there was a need out there for a simple comparison chart to help see the actual difference between the various Keurig models. So, we’ve put together this chart to help you choose the best Keurig coffee maker for you. Because of the limited space, we did a separate chart for commercial grade systems further down in the article. Brews in under 2 Min. 1 min. 1 min. 1 min. 1 min. 1 min. * NOTE: The 2.0 Keurig Systems don’t officially support the non-DRM pods. However, there are work around methods that allow those systems to brew using non-DRM pods. Keurig Makes More than Coffee? I had heard that Keurig was branching out of traditional coffee into other areas. But, I had no idea how many until we starting researching for this article. Keurig is beginning to move into cooking and other areas that can be automated. 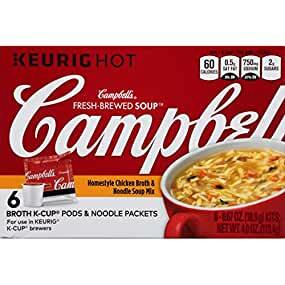 Keurig’s first foray into soup is with a partnerships with Campbell’s to create a couple of chicken noodle flavors. Other soup company’s are also trying to keep up by manufacturing K-Cup type products that can be used in a Keurig. Progresso Bistro Cups makes a Broccoli and Cheese Mix. Does the best Keurig coffee maker have to have all of these bells and whistles? We don’t think so. Keurig has several types of systems that manufacture food from K-cups. They have four categories of hot brew systems that might work for you depending on your needs. 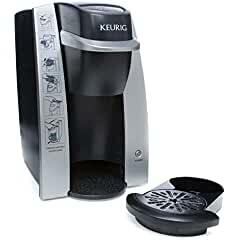 K250 – Comes with a charcoal filter, descaling solution, and 4 K-Cup Pods. The K200/K250 machine is one of the best machines if you want 2.0 technology, but you want a smaller footprint. This brewer has a 40 ounce reservoir, but it takes up a lot less space from side to side (width) than the larger K300/K400/K500 sibling systems. The nice thing about this model is that even though it is smaller, you don’t really lose the most important features. 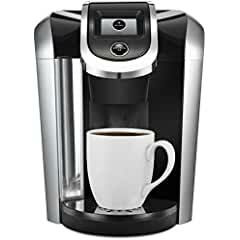 That is what makes this the best Keurig coffee maker in our opinion. Buy this space saving model to use up the least amount of space in your kitchen or where ever you need to put your K200/K250. The Keurig K300 Series of Keurig 2.0 systems is the “low budget” version that still supports the basic “coffee making” functionality. So, you won’t get the fancy features like auto brew for K-Carafes, or a fancy wallpaper color choices, or a color changing reservoir light. The footprint for this machine was a little large for us, this dropped it just a tad below the others for Best Keurig Coffee Maker. 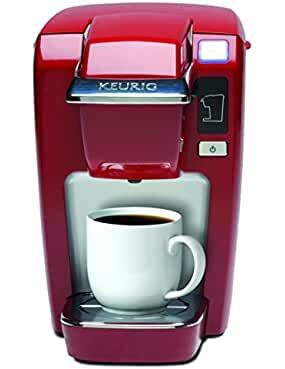 This model is the “Mama Bear” of the Keurig 2.0 systems. It’s right in the middle and some would say is “just right”. The K400 Series is typically about $20 more than the corresponding K300 model. And, about $30 less than the K500 Series. This model also had the larger footprint, but some of the added features made it tempting to make this system the Best Keurig Coffee Maker. The Keurig 2.0 K475 is next generation of Keurig K400 Series and adds a few more bells and whistles. Low, low/medium, medium, medium/high, high are the new available options for temperature control. The options range from 179 degrees to 198 degrees. The K500 Series (K500/K550/K560) of brewing machines are built to cover a wide range of users. So, if you need the versatility to brew small, medium and carafes, then the K500 Series is the system for you. If you have multiple family members that each have different coffee needs, and you like all of the bells and whistles (large LCD touch screen, customizable night light, timer controls for on/off, coffee strength controls, and water filtering), and you can afford it, this system is for you and your family. The 80 ounce water reservoir is perfect for those crowded early morning kitchens where multiple people want to get up and get going with a quick cup of coffee. The K500 Series is typically about $30 more than the corresponding K400 model. When I say “corresponding”, I mean K400=>K500, K450=>K550, and K460=>K560. If you prefer color in your brewer, you might want to look at the K400 Series. I could only find Black and Platinum for the K500 Series. 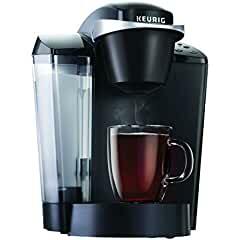 The Keurig 2.0 K575 is one of the newer Keurig K500 Series and is right now considered a top of the line model. A lot of the pictures of the K575 show the Thermal Carafe. But, it does not come with the K575. The Thermal Carafe does a much better job of maintaining your hot beverage than the ones that come with the K500 Series (K575 does not come with any carafe). If you are looking for the system that has pretty much everything, this system comes as close as any of the non-commercial systems. The price is the only thing that kept it from being the Best Keurig Coffee Maker. 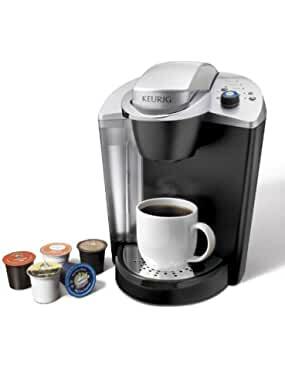 If your not sure what the best Keurig coffee maker is for work, we understand. After all, there are seven different models to choose from. WARNING: If you are thinking you might want to buy a commercial Keurig for your home, make sure the system is UL certified for Home Use. If it is not, this can void the machine warranty, and can also cause insurance issues for your home. 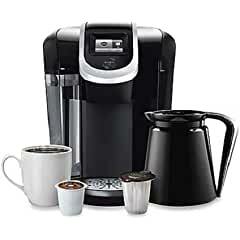 We didn’t include any of the commercial systems as candidates for the Best Keurig Coffee Maker because of the prices. Do You Want the BEST Commercial Keurig Coffee Maker? 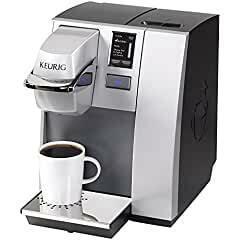 The Keurig K130 System is designed for a work environment where customers are coming and going. The instructions for using the system are printed right on the machine to inform those that are not familiar with the machine how to use it. This system is for single use brewing. There isn’t a reservoir for storing “readily available” water. Your customers just fill their cup with the amount of water that they want converted to coffee, and pour that water into the machine to be brewed. The K130 is built with a mug sensor to keep users that are not familiar (or children that are unattended) from removing the cup while coffee is being dispensed. This brewer is truly built to sit in an office waiting room, or any office where new customers or any external visitors are visiting the office on a daily basis. The Keurig Commercial K140 and Keurig Commercial K145 are designed for a small company of between 1 and 15 employees. The K140 does not come with any extra K-Cup pods, whereas the K145 does come with a 12 pack sampler. The K140/K145 systems brew coffee in less than one minute. That is very fast when compared to the K130/K135 brew time of just under 3 minutes. The K140/K145 also includes the ability to easily drain the machine. This is a feature that all of the Keurig commercial brewers come with. So, if you have a small office that has varying tastes in coffee, the over 500 options of K-Cup coffee, tea, specialty, and iced beverages will give your office plenty of choices. The K140 or K145 both provide an excellent product that can keep the whole office happy and productive. The Keurig Commercial K150 and Keurig Commercial K155 are the next step up from the K140/K145 brewers and can support an office size from 15 to 30 employees. The K155 does include a 12 pod sampler pack. As you move up the lineup of brewers, this is the first commercial brewer that includes the ability to connect direct line plumbing. Although, the 90 ounce reservoir might be big enough that you might not need direct line plumbing. The K150 brewer includea a little more flexibility by providing five brew sizes from 4 to 12 ounces. The K155 only brews four sizes. The K150/K155 color touchscreen is a nice touch if you are wanting to give your customers the impression of an upscale business. An additional feature of the K150/k155 over the K140/K145 is the ability to program the brew temperature. What comes with the beautiful color touchscreen is the ability to change the menu languages from English, to French, to Spanish. The K150/K155 also includes Keurig Quiet Brew Technology. This is a nice feature for those offices that have the need to keep the noise down. 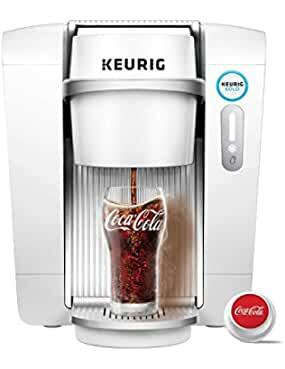 The Keurig K3000SE Commercial Brewing System is the largest and most advanced Keurig system and is designed for office environments of 30 or more people. The K3000SE does not have a reservoir, but is has Direct Line Plumbing which allows for continuous use. The K3000SE can produce a cup about one every 60 seconds. This system automatically ejects K-Cup pods into an internal garbage container and alerts on the LCD screen when the K-Cup garbage container is full. The K3000SE provides on screen instructions to guide the user through the brewing process in the user’s choice of English, Spanish or French. The on screen instructions make it easy to change by not burying the language choice deep inside of settings menus. So, if you have a busy waiting room, or break room that accommodates 30+ people at day, and you need a machine that is built to withstand the abuse that the general public typically brings, the K3000SE is the system for you. The Bolt® Z6000 Carafe Brewing System is the best Keurig coffee maker for the truly heavy coffee drinker or office of coffee drinkers. This Keurig model is for environments where a hot carafe of coffee is wanted “on the ready”. The Bolt® Z6000 requires that special Bolt® Variety Packs be used. These are the K-Cup equivalent “pods” that are specially built for the Bolt® system. The Keurig web site lists 10 different flavors. There are 6 Green Mountain Coffee®, 1 The Original Dounut Shop®, and 3 Tully’s Coffee® flavors to choose from. The flavors are a little limited. However, the typical use for this type of machine would be somewhere that you would want to provide a coffee flavor that isn’t way off the beaten path. Especially since it’s going to be shared among a group of people. The K-cup systems are the older models of Keurig. The new models use 2.0 K-cups. The difference is that the 2.0 K-cups have a code on the lid of the 2.0 K-cup that tells the more advanced 2.0 Keurig what inside of that 2.0 K-cup. 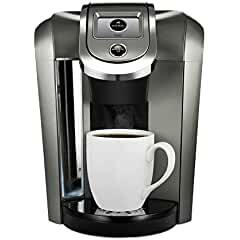 This means it knows if the K-cup in the slot is a single cup, a K-mug, or a K-Carafe. It also knows if what is inside of the 2.0 K-cup is coffee, tea, a specialty drink, an iced drink, mocha, or chai. Extra time doesn’t have to be spent “figuring” out how to program the Keurig. The 2.0 Keurig just knows what to do for each 2.0 K-cup you put into the machine. For many of you, that is wonderful! If you aren’t sure if you should purchase something that is so against freedom, you should know that there are underground movements to undermine this totalitarian movement against choice. Workaround have already been developed that allow you to use the old K-Cup pods with your new fangled Keurig 2.0 machine. So, if you want the latest features (see the table above) from a 2.0 machine, just know that you can still use old K-Cup or K-Cup compatible pods if you make a few illegal adjustments. It’s just against what the folks at Keurig want to force on you. Before you say, what’s with the sarcasm, it really convenient to not have to do all of those things. That is true. But, if you don’t think the executives from Keurig weren’t in a room salivating about the idea of all the extra sales they were going to get from 2.0 pods by eliminating competitor K-Cups, you’re crazy. We thought about making one of the older model non-2.0 systems be the Best Keurig Coffee Maker. But, once we realized how easy it was to beat the DRM, we thought some of the benefits that the newer systems have were just too good to pass up. 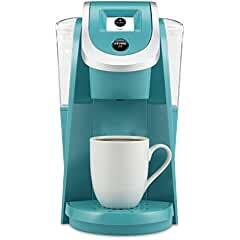 This Keurig system is one of the most affordable of the Keurig models. If that’s your criteria, then this is a good candidate for the Best Keurig Coffee Maker. 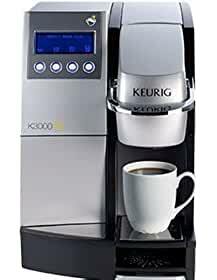 The Keurig K10 has been made obsolete by the Keurig K15. But, there are still K10 models to be found. One reason to look for a K10 is that it is about $20 cheaper (sometimes even more). The K10 comes in 12 different colors. But, the K15 only comes in 3. The different K10 colors cost different amounts. So, be careful when you purchase, because you might see a cheaper price in white, but then click over to the purple color and if you don’t notice the price change, you will be in for a surprise when you get the bill and you paid almost twice as much as you thought. Is the K15 Different Than the K10? The K15 appears to be the same machine as the K10. With the exception that it doesn’t have the issue that forces a recall by Keurig (see below for details). The K10/K15 brews 6, 8, or 10 ounces. Actually it brews the amount you pour into it at the top. So, just fill your coffee cup with the amount of water that you want converted to coffee, and you are good to go. Keurig K10 systems that were manufactured before July of 2014 were recalled by Keurig due to safety issues associated with hot water unexpectedly spraying and causing burns. If you do end up with a system that was part of the recall, use this government link to understand how to check if your system was part of the recall. This government web site lists all of the serial number ranges that were part of the recall. The K15 doesn’t have this same issue. If you find out your system was part of the recall, you can receive a free “easy to install” kit that will repair your Keurig K10. Keurig used to make several coffee machines that were targeted at people that just needed a quick cup. Those machines had varying features, but the main thing they had in common was that they only brewed for different cup sizes. So, no mug or carafe pods. 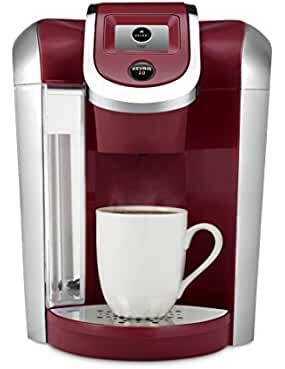 This Keurig K55 Coffee Maker is the only machine in that category that is still listed on the Keurig web site (at least as of the release of this article). The other machines were K40/K45, K50 (Keurig K50 vs K55 difference? Or, K55 vs K50? they are virtually identical with K55 being the later version), K60/K65, and K70/K75. You can still buy some of these models on Amazon (or other online sites). But, the K55 is the only one you can buy from Keurig on their web site. My guess is that the K55 has lasted as long as it has because it is a top seller for Keurig. The big benefit that many still find with the K55, is that it doesn’t have that 2.0 DRM feature. This allows the K55 to use the old K-cup packs and other knock off brands that came along at cheaper prices. If you really don’t like the new DRM aspect of the Keurig 2.0 Systems, you should probably get one of these “older” systems before they disappear completely. Even though this is one of the “older” systems, this model was worthy of consideration as the Best Keurig Coffee Maker. It was a close competition and barely lost to the eventual winner. The Rivo® Cappuccino & Latte System is designed brew to a perfect espresso, cappuccino or latte at home. The Rivo® requires the use of Rivo® pods. But, the coffee in the pods is quality Italian LavAzza® coffee. We’ve reviewed LavAzza® coffee beans before and they have proven to be “up to snuff”. You place the milk or non-dairy alternative in the small carafe that is provided, pop in a Rivo® pod, and the machine does the rest. And, it does it in under a minute! That’s actually pretty amazing if you ask me. Regular milk and/or cream froth the best. 1/2 percent also works, just less froth. Coconut, almond and soy also work. Almond and soy also froth less than regular milk. And, coconut froths the least. You can really use any type of milk, but the brand and type of milk will vary. If you have the time and like the process of making it yourself, you should find those articles useful. 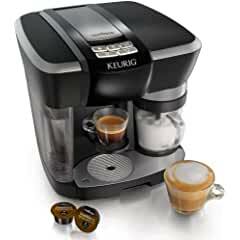 But, if you just want the convenience and simpleness, the Keurig Rivo® is a fantastic alternative. On the Keurig web site I found 4 flavors of Rivo® packs. But, read on to see how you can expand your choices by constructing your own reusable pack. Be sure you give dial2Fast a thumbs up, or subscribe if you really liked the video. The Keurig® KOLD™ Drinkmaker is Keurig’s entry into the soda market. This machine is intended to compete with products like the SodaStream. So, this isn’t really a brewer as much as it is a maker of carbonated or non-carbonated soda style drinks. Keurig, as usual, has marketing agreements with all of the big name companies. So, instead of waiting for that special 3 12 packs of soda for $12 at the grocery store, and filling up your pantry and refrigerator with cans and cans of soda, you can instead store much smaller packs and make you own soda on demand. The marketing video for Keurig® KOLD™ says the drink that is made comes out chilled (39˚F) and doesn’t need ice. But, for someone like me from the deep South state of Texas, it just gets too hot around here to not have ice in your drink. Of course, you can just put ice in your cup. Just make sure you leave enough room for the soda or you might have a mess on your hands. The drink size that it makes is 8 ounces. So, if you want more, you’ll have to do it in multiples of 8. The machine comes in black or white to match most other kitchen appliances. WAIT! There is no CO2 canister. Genius! I may need to trade my SodaStream in. There are 12 different flavors of drinks (carbonated and not) that have ZERO calories. I can tell you from personal experience that regular non-diet soda drinks can pack on the pounds. If your belt is starting to feel a bit snug, substituting zero calorie drinks for those other high calorie drinks is a great first step at keeping the scale under control. While this isn’t really in the same class to be considered the Best Keurig Coffee Maker, it provides a solid function that has a real chance at succeeding in it’s market, if it can keep the pod prices down to a reasonable amount. In our tables above, we list a short description of features that each Keurig coffee maker exhibits. Here is a longer description of what each of these features actually mean. The feature allows the user to control just how hot or warm their cup of coffee gets. This allows the user to get a scalding hot cup, if they so desire. Or, to get a cup that is sippable right out of the machine. To control this feature, the user uses the menus to select the feature. The various machines control this feature in several different ways. For some of the models, it is pressing the menu button a certain number of times until the SET BREW TEMP menu choice is shown. Once showing you can adjust the brewing temperature to between 187 degrees and 192 degrees by selecting between LOW, LOW/MEDIUM, MEDIUM, MEDIUM/HIGH, and HIGH. Other models automatically select the temperature based on the size of the pod (cup or carafe). The K150/K155 allows for adjustments up or down by up to 5˚ from 193˚F. See the tables above for how each brewing machine performs this action. Tthe best Keurig coffee maker systems have this feature. In fact, they all do. The tray is what you put your cup on when you are brewing a single cup. Typically a tray holds up to 8 ounces of liquid should the cup not be in place, or if it is removed while dispensing coffee/water. It is removable for when you need to use a tall glass/mug, or for some systems when you are brewing using the carafe. The Keurig 2.0 Brewing Technology™ refers to the ability of the Keurig 2.0 brewers to be able to read the 2.0 K-Cup, K-Mug, or K-Carafe pods and recognize what options to provide to the user. For example, when you put a 2.0 K-Cup in the 2.0 brewer, that brewer will only ask for cup sizes that are appropriate for a K-Cup (the small range that is typically between 4 and 12 ounces, depending on the brewer). Or, if you put a K-Carafe pack in the machine, the system knows to only ask for different carafe size options. Many users find this technology offensive since these 2.0 brewers could have been programmed to still support the older K-Cup pods. But, all of these 2.0 brewers instead give an error and say that the pod is unsupported. See below for ways to work around that error to still be able to use your old K-Cup pods. Many of the best Keurig coffee maker systems have reservoirs that hold several cups worth of potential coffee. Because of this, the machine may go hours between uses. So, either the system keeps the water warm during all of it’s down time, wasting electricity and heating the environment around the system. Or, the system provides an ability to automatically shut off. Keurig chose the 2nd approach (auto shut off). As such, if the system has been off for some time, some of the systems require a “warm up” time period. After “warming up”, they can then dispense multiple cups in a row (until the reservoir is empty) in much shorter times. Information on the internet is not clear on all of the “reservoir” Keurig systems. The “marketing” pages that Keurig puts out have conveniently left out if there is a “warm up” period. Or, if the system can just instantaneously heat up to provide similar times as the other systems that require warm up. Our guess is that the folks in Keurig marketing decided to take that part of the product description out because it emphasized a “negative” part of the product. This feature means that the system supports the original K-Cup without the new Keurig 2.0 Technology (that some call DRM). Keurig supports several pod types. The pod is the flavor that is put into the machine that the system uses to brew or “flavor” the selected drink. The last two “Reusable Filter” pods allow you to put your own coffee grinds from whatever source you want into the “Resuable” pod. This feature is whether or not the particular Keurig system supports this product. The Keurig My K-Cup® Reusable Filter allows you to put your own coffee grinds from whatever source you want into the “Resuable” pod and brew your own coffee grinds using the machine. This feature is whether or not this Keurig system supports this product. The Keurig 2.0 My K-Cup® Reusable Filter allows you to put your own coffee grinds from whatever source you want into the “Resuable” pod and brew your own coffee grinds using the machine. Whether the Keurig system has a reservoir and what size the reservoir is. The reservoir hold multiple cups of water so you don’t have to refill the Keurig machine for each cup that is brewed. The larger the reservoir, the more cups of coffee that can be brewed before having to refill the system. It should be noted that systems with reservoirs sometimes stay “on” longer than those without reservoirs. Also, be sure to take notice of the cleaning schedule recommend by Keurig in your owners manual. There are warnings to ensure that you don’t allow standing water to sit for months and months allowing mold to grow. Some Keurig systems have a button either on the screen, or on the system that, if selected, causes the system to brew the coffee stronger than if the option is left off. Whether or not the system accepts K-Carafe pods, and is able to brew a Carafe of coffee. All of the Keurig 2.0 systems now support a carafe. Some of the come with an inexpensive plastic carafe that gets the jobs done (kind of). The Bolt comes with a Bolt Thermal Carafe that does a much better job at keeping the coffee hot. A regular Keurig K2.0 Thermal Carafe can be purchase separately for 2.0 systems and like the Bolt Thermal Carafe does a much better job at keeping your coffee hot. Whether or not the Keurig system allows options to change the temperature of the coffee coming out of the system. Keurig has several systems that do not allow for a change in brew temperature. And, Keurig has provide various methods of changing the brew temperature. The more “fancy” the brewer, the better options exist for this feature. 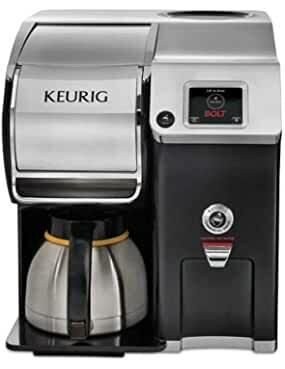 Several of the best Keurig coffee maker systems do allow the system to dispense hot water. For most lower grade systems, the method is to open and close the machine lid where K-Cup pods are inserted. Except when you open the lid, make sure that no pod is inserted into the system. You then select the cup size and the system dispenses that amount of hot water. Over time, Keurig has obviously received feedback that fixed amounts of hot water is not the preferred method. So, in a couple of models, you had to hold down the “dispense hot water” button for the hot water to come out. I think (just my humble opinion) once those models came out, the quite masses became much more vocal than the previous complainers, because Keurig went back to the “press a button get a fixed amount of hot water” model. I’m not convinced Keurig is satisfied with a final answer on this “right” dispense method. But, I suspect as new models come out, we’ll get a better idea what Keurig is hearing from the masses about what is the “right” method. The Water Filter Kit is typically on Keurig systems that have reservoirs. The idea here is that as the water is being poured into the reservoir, it is passing through a water filter like you see in Brita water filter pitchers. The water is filtered to remove any impurities you might have in your tap water. Several of the Keurig systems have a feature to automatically turn off. Some of them just automatically turn off after a period of inactivity between 90 seconds and 2 hours. The more sophisticated models can be programmed to turn on/off at specific times. This is really a fancy name for the previous feature where the Keurig turns itself off. When it turns itself off, it is “saving energy”. The Keurig web site and many other sites don’t do a good job of stating that these two features are the same thing. If you are at high altitudes, like over 5,000 feet above sea level, water boils at lower temperatures. So, this feature is very useful to keep from getting a cup that you have to wait 15 minutes to drink! When this feature is enabled, the brewer brews to a lower temperature to compensate for the altitude. If you are at a higher altitude, you should also check to see if your K-Cup (or other pods) have a build up of pressure. Some have reported that the Keurig can have problems using pods that have a build up of pressure. The work around for this problem is to pierce the pod (doesn’t have to be a big hole) to release the pressure before putting it into the machine. For some Keurig systems that include a water reservoir, a light exists that can light up the reservoir during the night. Some of the higher end systems allow you to pick between four colors for this light. For Keurig systems that include a touch screen, or LCD screen, these systems have the option of choosing between English, Spanish, or French for the language to use on the screen. The Keurig K3000SE Commercial Brewer can automatically eject the K-Cup pod into an internal garbage storage container inside the brewer. That system also automatically informs the user on the LCD screen when the K-Cup garbage container is full. With the Easy Drain Feature, Keurig systems that support a reservoir or have internal water buffers can drain all water from the system. This should be done from time to time during cleaning and if the system has been left standing for any period of time (maybe over Christmas holidays?). The feature that provides “on machine instructions” only exists in actual writing on the machine for the Keurig K130. Several of the other Keurig systems that include an LCD screen also provide “guidance”. I’m not sure I’d go to the level of “instructions”. The Keurig K3000SE is the only system that provides an option to add an attachment that turns the brewer into a “vending machine” brewer. With the additional option (sold separately), in order to use the K3000SE, you have to insert coins into the attachment. UL Listed for Household means that the brewer has been testing for a home environment. This typically means that the parts are a little less rugged (and the system typically less expensive) and the electrical system is designed for a a home environment. From my research, the Keurig systems are either UL Listed for Commercial, or UL Listed for Household. Many other web sites show some Keurig brewers listed for both. I personally don’t believe that to be true. Make sure you check with Keurig before trusting one of those other sites, because many people online are saying that Keurig won’t honor their warranty if the brewer is used in an environment for which it is not UL Listed. If the coffee maker tests for a commercial environment, it can earn the UL Listed for Commercial title. This typically means that the parts are more rugged and the electrical system is designed for a commercial environment. If the coffee maker tests for a household environment, it can earn the UL Listed for Household title. Often households have different electrical requirements than businesses. So, make sure you are buying the best Keurig coffee maker for your situation. NSF stands for National Sanitation Foundation. When a product has gone through NSF testing, this means that it is suited for a food service environment. Here are a few of the accessories that you sometimes get with your Keurig, or sometimes you have to buy extra. Lately, Keurig seems to be going towards keeping the machine cost lower by not including the accessories. The Keurig web site (I’m sure you can find it), sells all of these online on their site. I hesitate to list these models. Some people claim some of these do still exist. For some of these, I was able to find them on sites like Amazon. However, whenever I found one of them, the Amazon page either said “Out of stock”, or said there were only like 1 or 2 (or some number less than or equal to 5) left. We hope this page will help sort out some of the confusion that exists out there in terms of what the best Keurig coffee maker systems are out there, and what their features are. We learned a lot while researching all of the different Keurig systems. So, even though creating this article was very tiring, there is a strong sense of satisfaction to help organize a topic that very much needs organization. Please don’t forget to comment if you feel that anything we’ve stated isn’t correct. There were a lot of conflicting pieces of information out there. So, when we ran into that, we had to try and judge which information was incorrect (looked like a cut and paste issue or something like that), and which information just made more sense to be correct. Do You Want the BEST Keurig Coffee Maker? This page took a LONG time to put together, we hope it does provide you some value. And, that it does help you to pick out the Best Keurig Coffee Maker for you. If you found our work useful, help us out by using the social button on the left to share our work! – Coffee Bean Menu < Loved it! Just like any appliance that sees a lot of use, your Keurig products also needs a deep cleaning every once in a while. I couldn’t agree with your more. Thank you so much for the YouTube video that shows a great way to do just that!